According to Harold L. Peterson in his book 'American Knives', the pocket knife has existed since Roman times. Large, folding, single blade 'Jack Knives' were carried by soldiers during the American revolution. Many different designs became popular during the nineteenth century which contained more specialised blades. These knives included, Stockman's; Veterenarian's; Fisherman's; Pruning; Budding; Grafting; and Electrician's. As well as a general purpose blade, other blades may have included, a corkscrew, saw, awl, screwdriver, scissors, file, bottle opener, can opener etc. In 1862, the largest Sheffield knife manufacturer of the time was George Wostenholme and Son Ltd. As described in Pawson and Brailsford's 'Illustrated Guide to Sheffield', the factories occupied an area in excess of one acre with more than 800 employees. 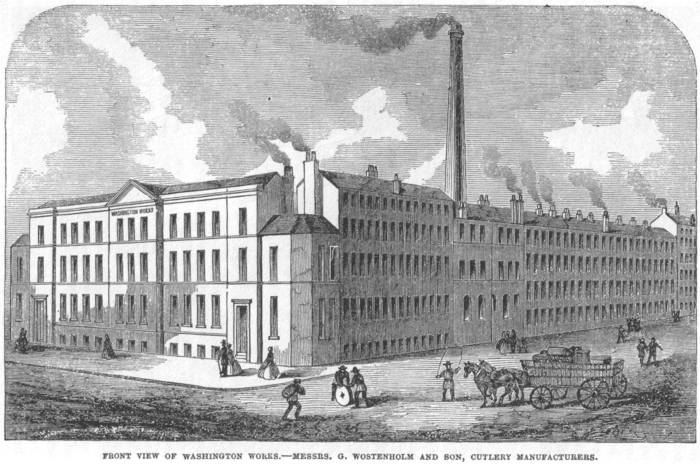 George Wostenholme and Son Ltd catered largely to the American export market, and the factory was named 'Washington Works'. Their product catalogue from 1885 consisted of 53 pages illustrating over 500 patterns of pocket knives, fixed blade knives and razors. Knife patterns included, pruning; budding; farriers; erasers; desk; sheep-foot; speying; one-blade; two-blade; three-blade; four-blade; four-blade tobacco knives; nail; cigar; corn; pencil; scvissor; sportsman's multi blade knives; champagne; and lock knives. Handle materials included ivory; mother of pearl; shell, stag horn; bone; imitation stag-horn; ebony; buffalo-horn; and black composition. The Northfield Knife Co, formed In 1858, in Northfield, Connecticut, had connections with Sheffield, England. Many of the skilled Sheffield knife makers had emigrated to the USA, including Charles W. Platts, who was involved in several knife companies. Cattaraugus Cutlery Co. was established in Little Valley, New York. In 1896, in Gowanda, New York, pocket knife production was started by C. Platts and Sons Cutlery Co. In 1900, a union of American Manufacturers of Pocket Cutlery issued a joint warranty guarantee. Among the 23 knife manufacturers listed were, C. Platts' Sons; Cattaraugus Cutlery Company; Northfield Knife Company; Ulster Knife Company; Camillus Knife Company; Tidioute Cutlery Company. Many pocket knife blades are now redundant due to advances in technology and lifestyle changes. Historically, the penknife was a small knife used for trimming quill pens, before the invention of the steel pen. 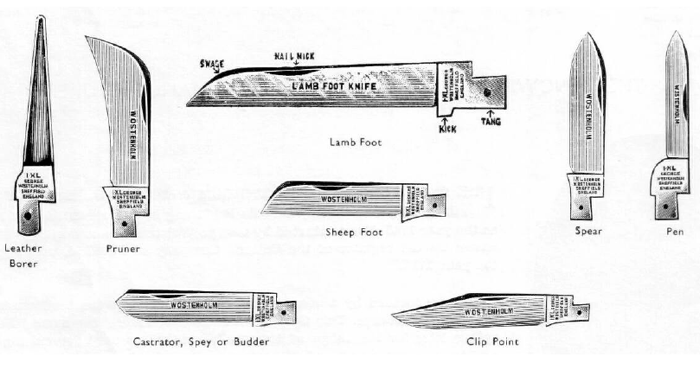 Veterenarians' knives with fleams for blood letting and farriers knives with hoof-picks and hoof files are also consigned to history. Corkscrews are not needed because of screw-top wine bottles, neither are can openers, as tinned food cans now have ring-pulls. Peterson, Harold L. (1958). American Knives. Gun Room Press, NJ.